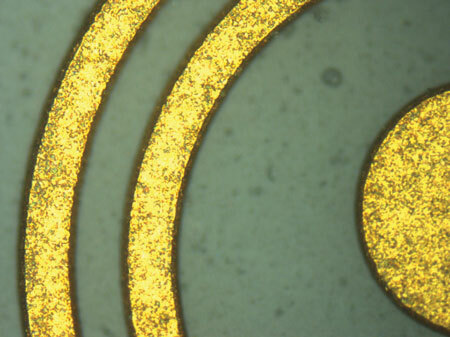 Etching circuits using the anisotropic Ion Beam Milling system has long been considered a superior approach over the more haphazard and inconsistent results obtained from the Chemical Etching process. The latter process has found a niche market for passive microstrip microwave circuits such as bandpass filters, Lange couplers, and other microstrip circuits with features requiring small, well defined metal lines and gap spacings. This paper describes some focused experiments conducted recently to resolve these suppositions. One needs only to visually compare the results of ion beam etching versus chemical etching to see a difference as shown in Figures 1 and 2. Figure 1 • Chemical Etched Transmission Line. Figure 2 • Ion Beam Etched Transmission Line. Figures 3 and 4 at 1000X further demonstrate the difference in edge acuity. Figure 3 • Chemical Etched Microstrip Line Edge. Figure 4 • Ion Beam Etch Microstrip Line Edge. The question though has generally been the degree to which the actual performance of the circuit is affected. To finally answer this question, Ion Beam Milling Inc., undertook some experiments as well as partnered with some of our customers to determine how much of a difference ion beam etching makes. First, we designed some simple bandpass filter test circuits that would be produced using both ion beam and chemical etching processes. These circuits would be tested in a fair competition using a state-of-the art vector network analyzer (VNA). For the first round of testing, two filter designs were created; one at 12 GHz that was based on a published design1 and the other at 24 GHz that was scaled up to 24 GHz from a lower frequency design. A bandpass ½ wavelength resonator filter design was chosen as its combination of line widths and spacing would be a good test of the relative capabilities of the two circuit manufacturing techniques. Furthermore, the filter’s performance could be easily measured using available test equipment and coaxial interface fixtures. The circuits were manufactured on 10 mil thick polished alumina (Al203) substrates using titanium tungsten (TiW) and gold (Au) metallization (See Figures 5, 6). While nickel (Ni) is commonly used as a barrier layer for solder applications, Ni is a poor candidate for chemical etching due to its propensity to be undercut by the etch process. Because of this, it was decided to omit Ni from our test designs to create a “level playing field” and not give ion beam etching an unfair advantage. Figure 5 • 12 GHz Bandpass Filter Test Circuit. Figure 6 • 24 GHz Bandpass Filter Test Circuit. The same design was used for both the ion beam etch and chemical etch test pieces; however different photomasks were employed because chemical etching requires an etch correction factor whereas ion beam etching does not. The filters were designed to use Southwest Microwave Super SMA End Launch connectors that are rated for frequencies up to 27 GHz2. 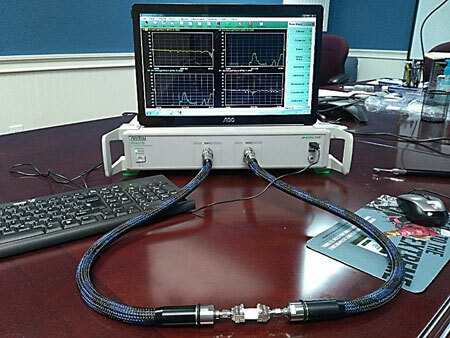 The connectors are designed to introduce minimal fixture variability into the test environment (see Figure 7). Figure 7 • SMA End Launch Connector. To make the experiment as fair as possible, the chemical etching was performed by a third party who has more than twenty years of experience with that process. Ion Beam Milling Inc. produced all the ion beam etched circuits used in the test. Prior to presenting the results of the testing, there are a few things that need to be borne in mind; First, these test circuits were either created from a standard design or else scaled up from a lower frequency design to demonstrate the intended performance. No additional simulations were used in the creation or tuning of the filter designs. Secondly, aside from the etch method and the photo mask etch factor, there are no differences between the ion beam etch samples and the chemical etch samples. Five pcs of the 12 GHz bandpass filter were selected (out of ten that were manufactured) and assembled into the end launch test fixtures (see Figures 7, 8). 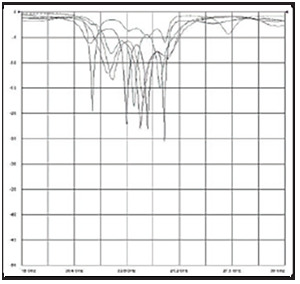 Frequency sweep testing was performed using an Anritsu Shockline Vector Network Analyzer, Model MS 46322B, as shown in Figure 9. Following very careful visual inspection to cull out any obviously bad circuits, five ion etch circuits and five chemical etch circuits were selected. 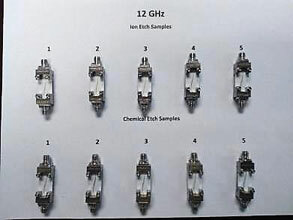 The five ion etch circuits were mounted into fixtures and tested one-at-a-time followed by the five chemical etch circuits. The same procedure was followed for the 24 GHz filters. Figure 8. Test Circuits Mounted in End Launch Fixtures. Figure 9 • Vector Network ANA. A comparison of the return loss on the 12 GHz circuits between ion beam etch and chemical etch processes does not show much variability. Both sets of circuits had reasonably similar return loss3 performance both in terms of circuit-to-circuit consistency (repeatability) and overall performance. Figure 10 • 12 GHz Ion Etch Return Loss vs. Frequency. Figure 11 • 12 GHz Chemical Etch Return Loss vs. Frequency. 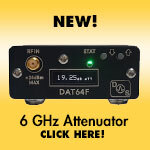 Things change rather dramatically however once the frequency is increased to 24 GHz. See Figures 12 and 13. Figure 12 • 24 GHz Ion Etch Return Loss. 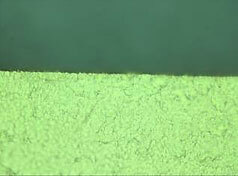 Figure 13 • 24 GHz Chemical Etch Return Loss. While the ion etch return loss at 24 GHz looks like the return loss at 12 GHz, the parts that were chemically etched have a radically different result. Not only are the chemical etch circuits inconsistent in terms of their intended rejection frequencies, but circuit-to-circuit repeatability is virtually non-existent. For the simple filter designs tested, chemical etching appears to remain a viable approach provided the design microwave frequency is relatively low. 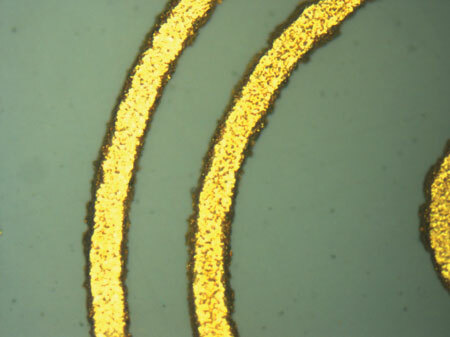 This stands to reason since chemical etching dimensional errors are small relative to the longer resonators at say, L-band, and it remains a viable process for many manufacturers. How long this will remain the case is debatable. 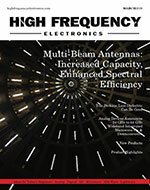 Microwave development is targeting increasingly higher frequencies, e.g. millimeter-waves, and it is questionable whether chemical etching will be able meet the challenge. While the testing performed so far does not identify a definitive frequency crossover point, it’s safe to presume that for circuits designed to operate at frequencies approaching 24 GHz, chemical etching may yield substandard results when compared to the performance of ion etched circuits. Additionally, as noted earlier, the circuits tested so far did not incorporate nickel in the designs. Had Ni been included, it is likely that the variable undercutting of Ni common to the chemical etch process would have manifested in even greater variability and performance deficiencies relative to ion etched circuits. 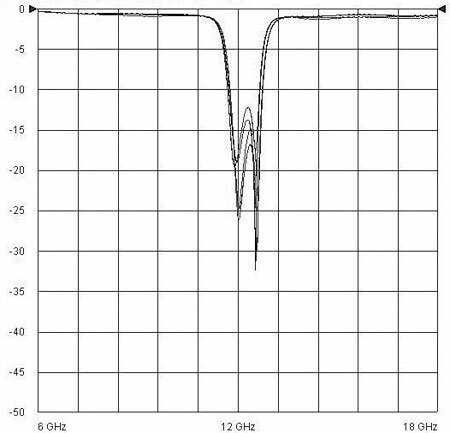 The results obtained from the simple filter testing prompted us to explore the etch method processing differences when a more complex circuit design is employed. To this end, we requested permission from one of our longtime customers to use one of their designs in our “head-to-head” testing. They agreed with two caveats: We are unable to disclose who the customer is or to show any images of their design. Secondly, we are forbidden to disclose the operating frequency and must either redact or change it if we choose to include its return or insertion loss data. What we can disclose is that the design is a relatively complex band pass filter that operates at a frequency below 10 GHz. We proceeded to manufacture a small quantity of test filters that would fit into the end launchers. 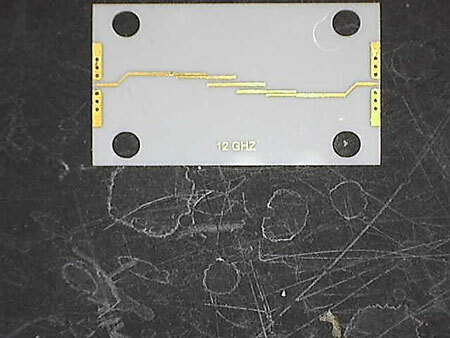 Unfortunately, due to the relative thinness of the substrate material combined with the longer length of the circuit due to its more complex design, more test substrates were broken than were expected while connecting the fixtures to the VNA. As a result, we only had three chemically etched samples and two ion etched ones that survived the testing long enough to produce meaningful data. 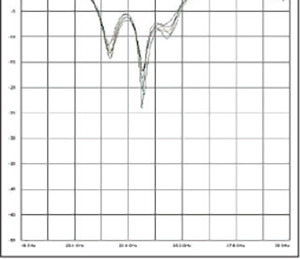 Figure 14 shows the return loss over a 1 GHz interval. Several things of note can be seen in this plot. 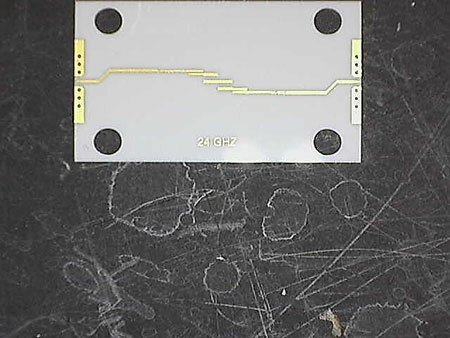 First, while the ion etched circuits followed an almost identical track, the chemically etched circuits display greater circuit-to-circuit variability. The data from a third chemically etched circuit showed performance even worse than the two depicted above, so it was intentionally omitted. The second item of note is the shift in the rejection frequency by the chemically etched circuits. 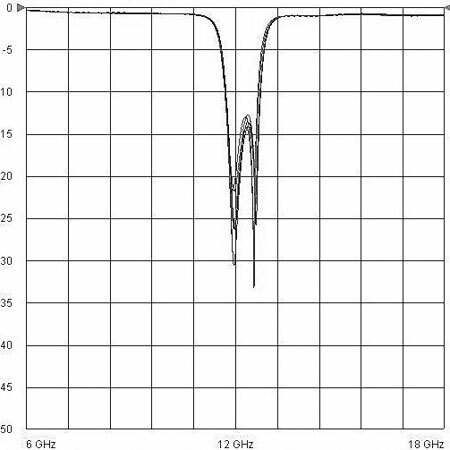 According to our customer, the ion beam etched circuits more closely follow the ideal curve predicted by the filter designers. The chemical etched ones present a divergence that would require tuning by the customer to make them suitable to be used in module builds. Figure 14 • Return Loss over 1 GHz range. Figure 15 shows the chemically etched test circuits display the same frequency shift seen in Figure 14. Some may argue that the frequency shift displayed by the chemical etch process is something that could be planned for and designed around. This explanation presumes that the chemical etch variation will be uniform circuit-to-circuit and batch-to-batch. This customers’ design employs Ni in its metal stack and as noted earlier, Ni does not etch consistently from batch to batch, so it may be impossible to fully compensate for frequency shift in the design itself and instead require individual circuit tuning. As ion etching does not have the same problems with Ni, the circuit-to-circuity repeatability should be exceptional. Unrelated to our own testing, a customer approached us and asked if we would be interested in making some ion etched samples using their existing design. Currently this design was used to produce circuits using a chemical etch process and they were interested to see if there would be any differences with an ion etch approach. Their conclusion was that “The Ion Beam Milling process improves Filter Bandwidth response as seen on previous page while realizing rejection criteria established during modeling. The customer was apparently pleased enough with the results of these tests that Ion Beam Milling Inc. received a mid-five figure purchase order following the completion of testing by the customer. 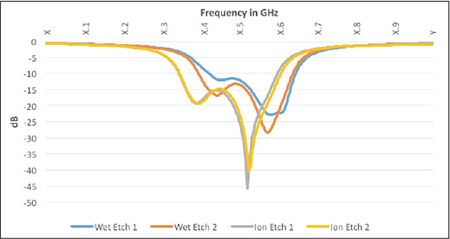 The ion beam etching process produces circuits with superior performance when compared to chemical etched circuits at virtually any frequency above 1 GHz. The degree of performance improvement is tied to a variety of factors including the complexity of the circuit design, feature size, and proximity of trace lines to each other. Additionally, ion beam etching will always produce better circuit-to-circuit and batch-to-batch consistency over chemical etching. If ion beam etching was a more expensive process than chemical etching, the cost savings achieved by not having to perform additional tuning steps (assuming tuning is even possible) during assembly or to discard a portion of the yield because it falls outside of acceptable design specifications, alone, would likely make up the difference in cost. Jim Barrett is President of Ion Beam Milling Inc., Manchester, NH. Ion Beam Milling is a company that has been in the Ion Beam Etching business for more than 35 years – the oldest ion beam etching service provider in the marketplace. Ion Beam Milling Inc. has three Ion Milling systems and has developed procedures and processes over the years that brings the price of ion etching into direct competition with chemical etching. Combine this pricing parity with the higher yields and reduced post processing costs required for Chemical Etched circuits and you will find that Ion Beam Etching is the economical choice as well as the performance one. 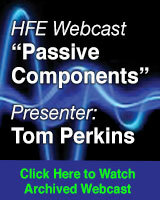 Tom Perkins is HFE’s Senior Technical Editor. With five decades of experience in RF and microwave engineering, he also provides technical consulting mostly to companies in the New England area. He is very involved in IEEE and AOC activities and has been a licensed radio amateur since 1957. 3. https://bethesignal.com Should Return Loss be Positive or Negative? Instrument presentation shows negative values.